Black cab app, Gett, has launched a series of outdoor posters that takes aim at rival Uber. Riding on the Transport for London's verdict that Uber is not "fit and proper" to operate in London, the campaign highlights the quality of the black cab service, fast journey times and highly trained drivers. 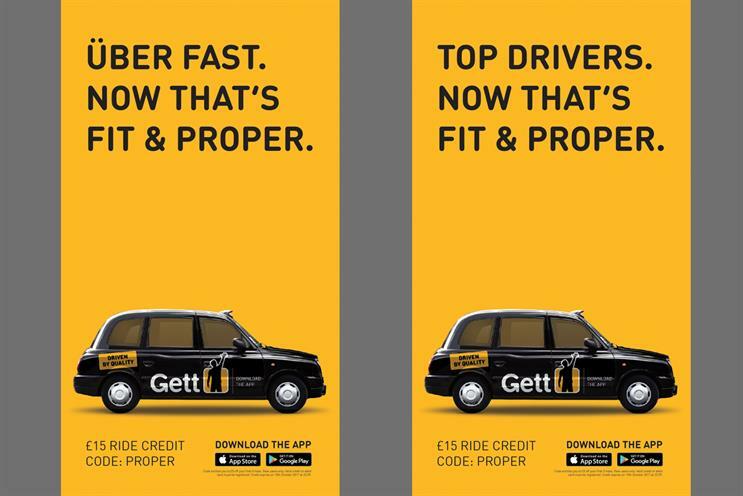 The campaign was designed in-house by Gett's marketing team and includes captions such as: "Über fast. Now that’s Fit & Proper". Starting today, the posters will appear across stations and bus shelters throughout central London. "As more people question the credentials of London’s transport providers, we wanted to remind customers that Gett offers an unparalleled experience in the capital," Matteo de Renzi, managing director of Gett UK said. "Our trained drivers pride themselves on quality and providing a quick and efficient journey, deemed fit and proper by all." Since TfL's ruling against Uber, Gett reports a large jump in business enquiries.